Llanover Garden07753423635work GardenLlanover is a private, listed garden, set in the beautiful Usk valley with views towards the Black Mountains and the Brecon Beacons National Park. The Rhyd y meirch stream tumbles through the garden passing unusual shrubs and trees, beneath arched bridges built in the eighteenth century, into the calm and reflective ponds, over cascades, alongside spectacular borders within the round walled garden, through the extensive lawns and onwards into the River Usk. Eight generations of the family have lived at Llanover, caring for the garden and its plants since 1792 when it was created by Benjamin Waddington, the father of Lady Llanover ( who championed Welsh traditions, language, music, literature and livestock). Some of the trees are over 200 years old, many of them are native to China, the Americas, as well as Europe. The lavish herbaceous borders are complimented by wildflower meadows and striking displays in vast urns and troughs designed by the Head Gardener , Peter Hall, formerly HG at Stourhead and Powis Castle . In 2016, a former pool was infilled and replanted with plants such as Hostas, Persicarias, Rudbeckias and primulas which enjoy damp soils. The grove of Acer Rubrum ‘Brandy Wine’ is being underplanted with swathes of Hydrangeas, interspersed with bamboo, willows, birches. 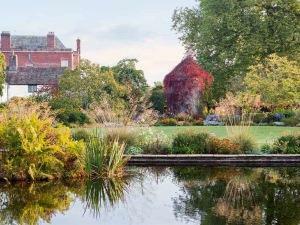 This garden has something to interest everyone throughout the seasons – never a dull moment! Please do look at www.llanovergarden.com or #llanovergarden to see a glimpse of the wonderful garden, meadows and arboretum here. Open by appointment to groups throughout the year. Llanover is a private, listed garden, set in the beautiful Usk valley with views towards the Black Mountains and the Brecon Beacons National Park.